The above graphic illustrated the first public meeting scheduled for the public in reviewing the update to the Dallas Bike Plan which passed on Wednesday, June 8, 2011. Since then we’ve heard various trials and tribulations for implementing the plan and how to help fund the plan. However, since today’s news of a safe passing ordinance went before the council and passed, along with a wide array of stripping that has occurred in the last few months, we seem to be turning the corner. One reason for the expedition in implementation could be that the city’s wheels just needed some extra grease in the cogs to help them move better. Recently, Keith Manoy, Senior Transportation Planner with the city and the one slated with implementing the plan, now works for the Public Works department. This may seem trivial, but there has been some reorganizing within the city staff to help get things moving quicker. Also staff positions like, Jared White, who helps oversee the city trail network and Max Kalhammer, the city’s only bicycle coordinator, have also been reorganized. So, on February 6, 2013 February 20, 2013, the city will get a briefing at the council meeting of the current and future progress. 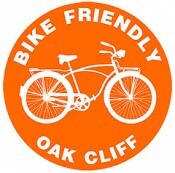 Be on the lookout for a group ride to the event, as well as other ways you can support the Dallas Bike Plan in 2013! Also, we hear that the city is re-establishing their Bicycle Advisory Committee. Email Max Kalhammer at max.kalhammer@dallascityhall.com. The very one organized to help plan & implement the 2011 Dallas Bike Plan, however they inadvertently didn’t keep it on board to implement. That action has hurt them in their planning efforts, most recently with the Continental bridge park design NOT including separated bicycle infrastructure. More to come on that story! Feb 6 meeting time & location, please…thanks! ‘Round this time last Monday , Angela Hunt told her colleagues on the council, as well as assistant city managers and transpo planners and city attorneys, that the way Dallas is executing its new bike plan is nothing short of folly. Said Hunt, we never, ever should have put those shared lanes downtown. Said Hunt, they’re merely “a nod to show we’re a bike-friendly city,” and in the end they’re going to create “a perfect storm for drivers to get pissed off at cyclists.” Hunt, a cyclist, figures in a couple of years the city will just roll its streets and cover up those markers and proclaim the bike plan dead on arrival.